As expected, the 2013 recruiting board has been updated and lives here. We're a little late posting this as the announcement came on Saturday, but since I was out of town over the weekend, we're playing a little catchup. Let the pillaging of Ohio continue. This week, it's 4-star cornerback prospect Gareon Conley who hails from Massillon, OH, home to the annual Ohio football state championship game, thus a regular breading ground for top football talent (i.e. Paul Brown, Chris Spielman). Rarely do corners step in and start as freshman, and given Michigan's rather unexpected turn of luck in the secondary since Brady Hoke stepped on campus, having young corners and safeties come up through the ranks could be more and more of a trend. Conley might be just the type of kid that makes an impact as a sophomore or junior as Avery, Countess, Floyd and other leave. 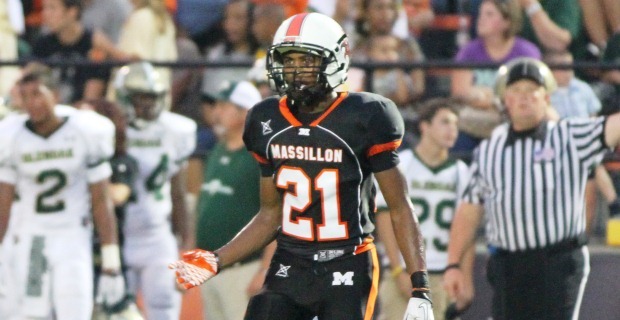 Being well stocked at corner now for the 2013 class, Conley does standout due to his size. You don't see too many 6-2 corners – usually 5-10 or 5-11. This does make him sort of a wildcard in that regard.